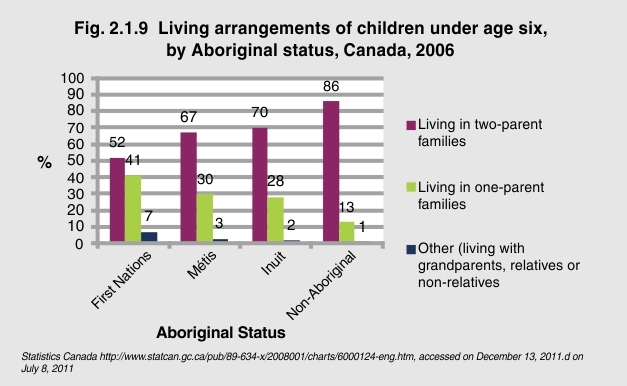 In Canada, the 2006 Census found that most (86%) of non-Aboriginal children under 6 years old lived in two-parent families, while 13% lived in lone-parent families and 1% lived in some other form of arrangement. Aboriginal children under 6 years old were more likely to be living in a lone-parent family compared to non-Aboriginal children. Of First Nations children, 52% under 6 years old were living in a two-parent family. There are far more Aboriginal children under 6 years living in lone-parent families than non-Aboriginal children of the same age. This puts Aboriginal children at increased risk of living in poverty.